For Spring,..I have a small garden,still many leaves to pick up,been changing the decking area,as I've decided I don't like a certain shrub there,yet last year I thought it looked great,..how about you,what have you been up to in the garden?.. Nothing other than sweeping up the leaves The ground is too wet to do anything with at the moment. It's nice to see the bulbs pushing their way up through the soil though. When I was cleaning my decking Mags,most of the leaves were dry and stuck fast,have to wait until it rains,as its to cold to get the hose out,lol....I always feel better after spending time in the garden. I can imagine that Pauline, leaves are a devil to remove when they are wet. Hi Pauline although I have some dead herbaceous plants in the garden and some leaves I have resisted the temptation to remove them because they are beneficial to some wildlife and the birds. I want to move a couple of things but won't do so until the soil starts to warm up in the spring. 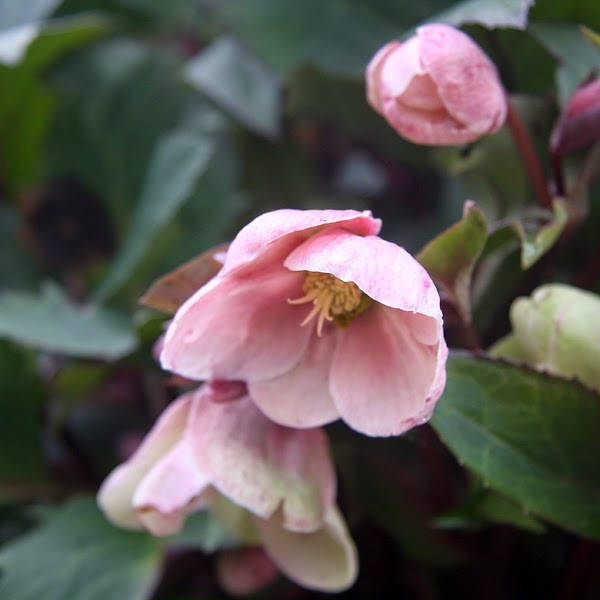 I am delighted to see my pink hellebores are in bud as are the primulas so something to enjoy in the winter gloom . We can't get to ours until March, the caravan site closes and we are not allowed to visit so it's always a bit of a worry now but exciting too when we go back and see what's survived. It's funny you should say that Meg,I have done exactly the same,I have left all the leaves on the borders and around the pond,as you say they are beneficial to wildlife and I have a lot of frogs,I must look up hellebores,as I don't know what that is,I also have something in bud,I have no idea what it is though,..today I cleared the decking,front of house,(pavement)and the stepping stones,..hope my frogs are cosy under the leaves. I lasted a couple of hours outside,as you say it was ffffrrrreeeeezzzzing!.lol.as for those leaves,they can stay there,stuck to the decking, these leaves were bone dry Mags,stuck to the decking.